The museum is open every Thursday from 10:00 am to 2:00 pm and from 10:00 am to 3:00 pm on the first Sunday of the month. Please note: The museum will be closed on Sunday 6th October 2019 which falls during the Labour Day Long Weekend. Group bookings can be arranged by phoning 02 8335 5330 during normal business hours on Tuesdays and Thursdays (0418 640 052 at other times) or by sending an email message through this website on the Contact Us page . 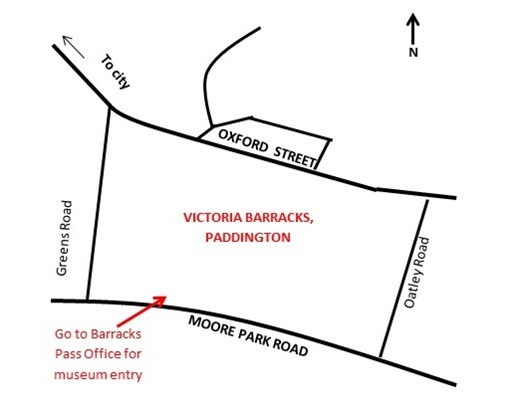 The museum is located at Victoria Barracks, Paddington and all visitors must enter via the Pass Office in Moore Park Rd, about 100 metres east of the intersection with Greens Rd. Photo identification for adults will be required and children must be accompanied by an adult. The entry fee to the museum is $5.00 per person, although school-age children and younger are admitted free of charge. The Victoria Barracks Corps of Guides conducts free tours of the barracks grounds at 10:00 am on Thursdays and it is recommended that you ask for a visit to the museum. You will need to arrive at the Pass Office by 9:30 - 9:45 am to allow time for the issue of a visitor’s pass. For more information about barracks walking tours, please phone 0411 694 024 or send an EMAIL request. Oxford St at Glenmore Rd, Paddington. Oxford St opp Hopewell St, Paddington. Please CLICK HERE to plan a trip by public transport.